What kind of DIY desktop computer kit can you get for just $128.00? The Intel NUC DN2820FYKH is so inexpensive and tiny (measures just 116.6mm x 112.0mm x 51.5mm) that it grabbed our attention and we just had to get our hands on one. The Intel NUC Kit DN2820FYKH is powered by an Intel Celeron N2820 processor (up to 2.4GHz dual-core, 1MB cache, 7.5W TDP) that also contains Intel HD Graphics that operates up to 756MHz with a single HDMI 1.4a video output. The kit comes with the processor, CPU cooler, power supply, motherboard, 802.11n WiFi card and the case. The only thing missing is a single 1066MHz DDR3L SO-DIMM memory module and a 2.5-inch notebook hard drive or solid-state drive. The final price of building up the NUC DN2820FYKH really depends on the hardware and OS that you install, but it shouldn’t be that bad. So, if you had to run out and buy everything you are looking at around ~$295 to get yourself into the Intel NUC DN2820FYKH. We highly suggest using Windows 8 or Windows 8.1 as Intel has yet to release all the drivers for Windows 7 let alone anything older than that. USB Flash Drive For Storage – Free? Who doesn’t have a pile of them! The total build cost for building an OpenELEC powered HTPC with the Intel NUC DN2820FYKH would be around $156 if you already have something like an 8GB USB Flash drive laying around. 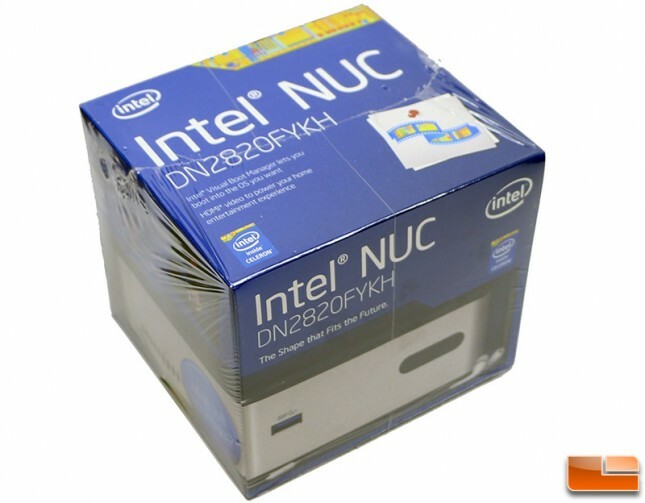 The code name for the Intel NUC DN2820FYKH is Forest Canyon and at one time Intel said they were going to send them out to be reviewed, but recently changed their mind. Legit Reviews went ahead and bought on through an online retailer so we can give you a look at this small form factor (SFF) system. The retail packaging was nicely done and shrink wrapped to ensure no one opens it before you bought it. 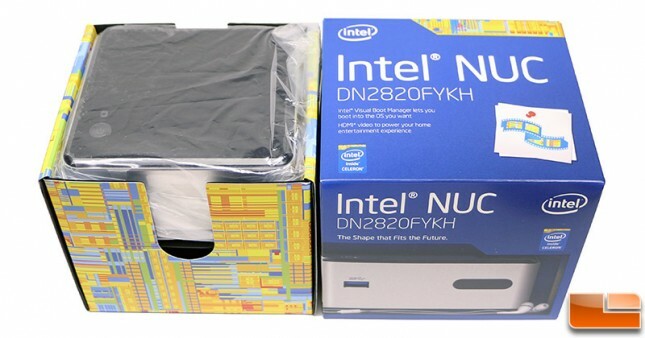 Once you remove the shrink wrap the box top lifts off and the NUC DN2820FYKH is sitting right on top in a plastic bag. 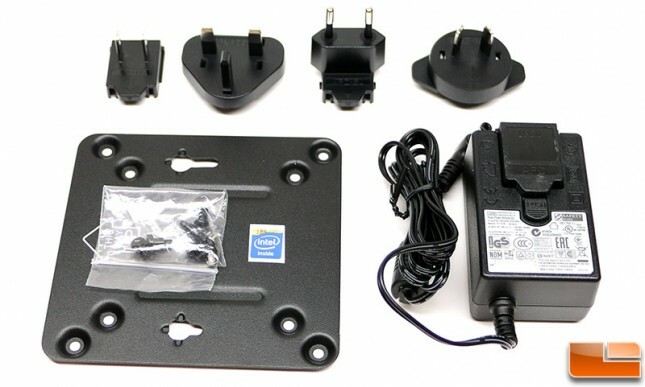 Under the Intel NUC there is the accessory kit that includes the a small AC power adapter with a 4-plug universal wall outlet kit (IEC types A/C/G/I), VESA mounting plate w/ mounting screws, storage drive screws and the smallest Intel Inside case sticker that we have ever seen! 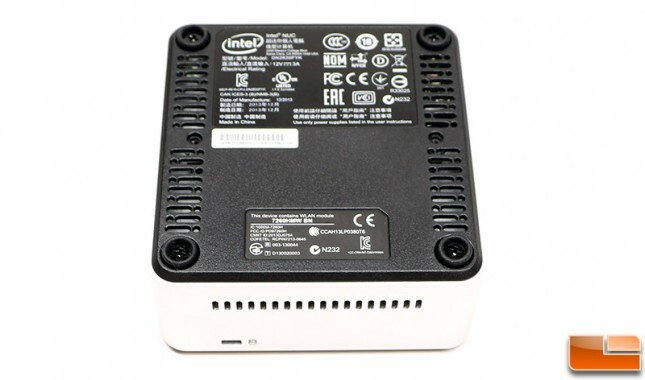 The 2-prong wall-mount AC Power Adapter included with the Intel NUC Kit DN2820FYKH is very different than the models we have seen included with higher-end Intel Core i3/i5 NUC models. 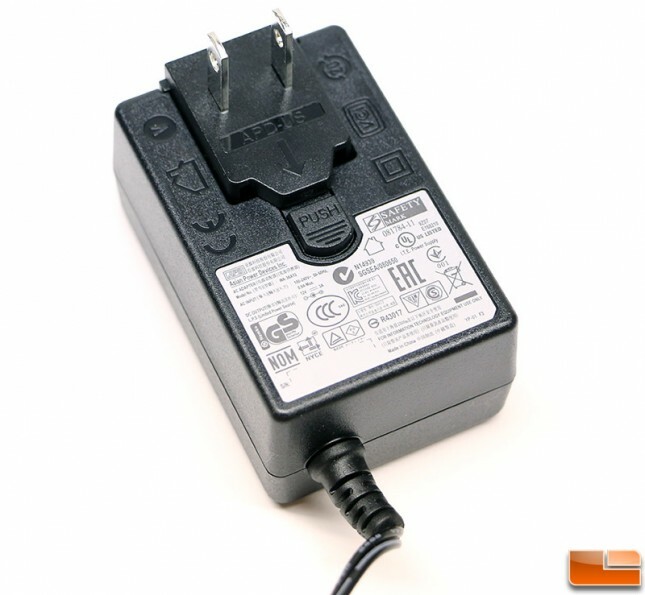 This particular AC adapter is made by Asian Power Devices, INC. (APD) and is model number WA-36A12. This AC adapter outputs 12V / 3A power and is rated at 36 Watts. This means that the Intel NUC Kit DN2820FYKH will pull well under 36 Watts of power at the wall if that is the included power supply. Does this AC power adapter looks familiar? With the exception of the DC plug, it is identical to the model that LaCie uses for many of their external hard drive solutions! 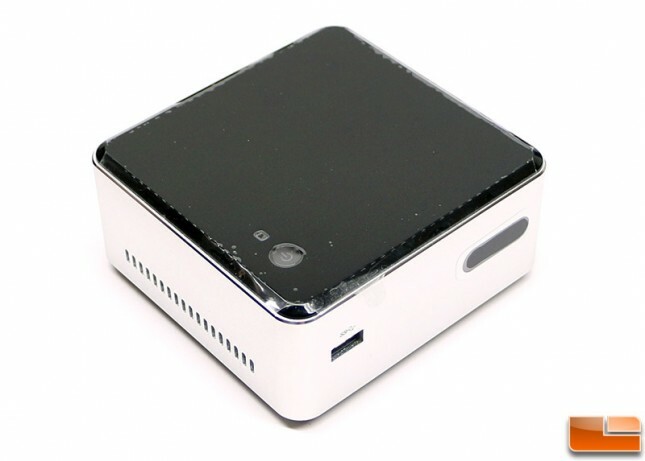 The Intel NUC Kit DN2820FYKH is an H-SKU, so that means it features the larger chassis that supports 2.5-inch hard drives that are up to 9.5mm in z-height. This chassis measures in at 116.6mm x 112.0mm x 51.5mm (4.59″x4.41″x2.03″), so even though it is bigger than some of the NUCs previously released, it is still small and will easily mount behind a monitor on its VESA mount. 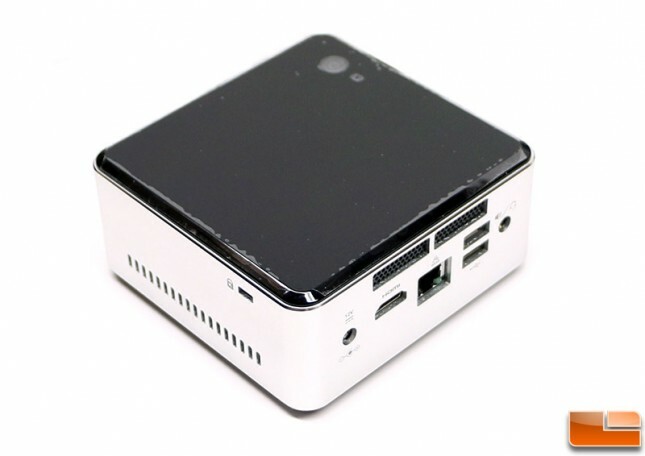 The NUC uses the new uCFF form factor (Ultra Compact Form Factor), which from what we can tell means that the motherboards are no larger than 4″x4″x2″, so the chassis can be any size. This chassis uses an aluminum center section that left its natural color with a black colored plastic top and a black bottom cover with ventilation holes. Intel ships the NUC with clear plastic film to protect the black gloss finish on the plastic top piece. We highly recommend leaving it on for as long as possible as the top plastic is easily scratched. For example if you take the NUC and slide it a few inches across a piece of paper it will come up looking like you brushed it along a piece of sand paper. The power button and storage drive activity light are located on the top of the unit. Across the front bezel you’ll find the only SuperSpeed USB 3.0 port and the consumer infrared sensor. When it comes to rear connectivity you’ll find the DC power plug, DMI 1.4a video output, Gigabit Ethernet, two USB 2.0 ports and finally a 3.5mm audio jack. It is worth mentioning that Intel went with Realtek solutions for both the audio controller (Realtek ALC283) and Gigabit Ethernet. Above the rear I/O ports there are a pair of exhaust ports to expel the hot air from the CPU cooler that is ducted to this vent. On this side of the NUC Kit DN2820FYKH chassis there is Kensignton lock to prevent it from being stolen in addition to the ventilation holes. Flipping the DN2820FYKH over we see the plastic bottom is held on by four Philips screws that are recessed down inside four rubber feet that ensure the NUC doesn’t slide or scrape the finish of your desk if you choose not to use the VESA mount. There are also more air ventilation holes on the bottom of the NUC, so airflow should be more than enough for such a small platform.